A question we see coming up more often is in regards to smoke detection above fire alarm control units. The specific questions is, "Are you required to install a smoke detector above the fire alarm control unit (FACU) or fire alarm control panel (FACP)?". "In areas that are not continuously occupied, automatic smoke detection shall be provided at the location of each fire alarm control unit(s), notification appliances circuit power extenders, and supervising station transmission equipment to provide notification of fire at that location. Exception: Where ambient conditions prohibit installation of automatic smoke detection, automatic heat detection shall be permitted." Also note there is an Annex section related to this reference. A.10.4.4 states that the equipment to be covered by this automatic smoke detection is a fire alarm control unit that is used to notify occupants and responders of a fire. The term Fire Alarm Control Unit (FACU) does NOT include annunciators or addressable devices. If the area where the FACU is located is continuously attended, a smoke detector is NOT required. Keep in mind this is not intended for lobbies or offices where there are occupants coming and going throughout the day. This is intended for areas such as lobbies with 24/7 security and security rooms where at least one guard is in attendance at ALL times. If the area where the FACU is located has full coverage smoke detection, then an additional smoke detector dedicated to the FACU is NOT required. If the single smoke detector intended to protect the FACU per 10.4.4 does not cover the entire space where the control equipment is located, then additional smoke detection is NOT required. Now here is were it may become confusing for the designer or AHJ. Section 10.4.4 as well as A.10.4.4 clearly state that the FACU to be protected is a control unit that is in place to notify occupants and first responders of a FIRE. As you may or may not be aware of, there are additional systems we deal with in this industry known as Dedicated Function Fire Alarm Systems. Building Fire Alarm System. A protected premises fire alarm system that includes any of the features identified in section 23.3.3.1 and that serves the general fire alarm needs of a building or buildings and that provides fire department or occupant notification or both. Dedicated Function Fire Alarm System. A protected premises fire alarm system installed specifically to perform emergency control function(s) where a building fire alarm system is not required. Here is the code section that indicates when a Dedicated Function Fire Alarm Alarm Systems can be installed in place of a building fire alarm system per NFPA 72 2013 edition section 23.3.3.2.1. "In facilities without a building fire alarm system, a dedicated function fire alarm system shall be permitted and shall not be required to include other functions or features of a building fire alarm system." Dedicated function sprinkler monitoring system: This is a system installed when a particular building does not require a building fire alarm system BUT still has an automatic fire sprinkler system employing more than 20 heads. Example could be a small strip mall (Group M) with under 100 occupants but more than 20 sprinkler heads. Although this system is not in place to notify occupants or responders of a fire, a smoke detector is required above the panel since this system is in place to monitor the sprinkler system. Per NFPA 72 2013 section 10.4.4 a smoke detector is required to protect "supervising station transmission equipment". Dedicated function elevator control system: This is a system installed strictly and specifically to control the emergency functions of an elevator such as elevator recall and shunt trip. These systems will typically have your elevator lobby/equipment room smoke detectors, heat detectors, relays and modules to perform the emergency control functions found in NFPA 72 2013 chapter 21. Note this system would not be required to be monitored as it is not in place to monitor the status of an automatic sprinkler system. In this case a smoke detector is NOT required above the control unit as it is not monitored nor is it in place to notify occupants or responders of a fire. between NFPA 72 2010 and 2013 editions. 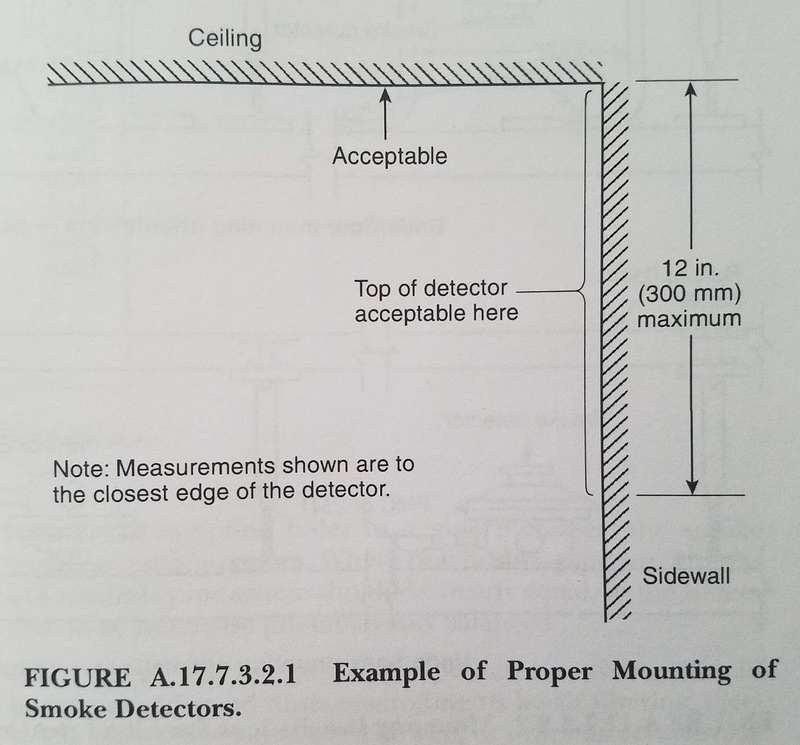 NFPA 72 2010 (A10.15 #1 and #2) state if the ceiling height is 15' or less, the smoke detector shall be installed on the ceiling or wall within 21' of the centerline of the FACU. If the ceiling height exceeds 15', the smoke detector should be installed on the wall no more than 6' above the top of the FACU. NFPA 72 2013 (A10.4.4) states the smoke detector shall be installed in accordance with section 17.7.3.2.1. 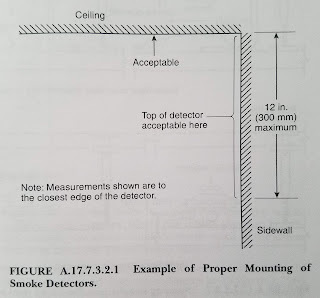 Section 17.7.3.2.1 states "Spot-type smoke detectors shall be located on the ceiling or, if on a sidewall, between the ceiling and 12 inches (300 mm) down from the ceiling to the top of the detector."